Fossil resource endowments and the future development of fossil fuel prices are important factors that will critically influence the nature and direction of the global energy system. In this paper we analyze a multi-model ensemble of long-term energy and emissions scenarios that were developed within the framework of the EMF27 integrated assessment model inter-comparison exercise. The diverse nature of these models highlights large uncertainties in the likely development of fossil resource (coal, oil, and natural gas) consumption, trade, and prices over the course of the twenty-first century and under different climate policy frameworks. We explore and explain some of the differences across scenarios and models and compare the scenario results with fossil resource estimates from the literature. A robust finding across the suite of IAMs is that the cumulative fossil fuel consumption foreseen by the models is well within the bounds of estimated recoverable reserves and resources. Hence, fossil resource constraints are, in and of themselves, unlikely to limit future GHG emissions this century. 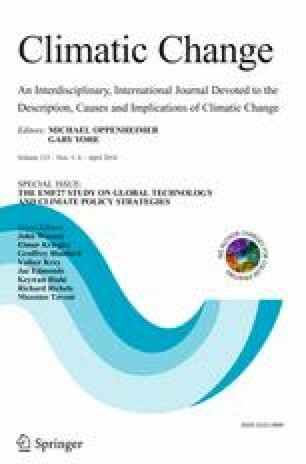 Our analysis also shows that climate mitigation policies could lead to a major reallocation of financial flows between regions, in terms of expenditures on fossil fuels and carbon, and can help to alleviate near-term energy security concerns via the reductions in oil imports and increases in energy system diversity they will help to motivate. Aggressive efforts to promote energy efficiency are, on their own, not likely to lead to markedly greater energy independence, however, contrary to the stated objectives of certain industrialized countries. The online version of this article (doi: 10.1007/s10584-013-0939-5) contains supplementary material, which is available to authorized users. We recognize the contributions of all EMF27 project partners for enabling the research results reported here, and we thank Jessica Jewell and Joeri Rogelj for making possible certain parts of our analysis. The comments of the editor and anonymous reviewers helped to substantially improve this paper. The contributions of D.M., N.B., and K.R. were supported by funding from the European Commission’s Seventh Framework Programme under the LIMITS project (grant agreement no. 282846). The views expressed by A.K. are purely those of the author and may not in any circumstances be regarded as stating an official position of the European Commission.